Southampton is a major maritime city, handling 1 million cruise passengers and over 3.4 million ferry passengers every year. The city hosts visiting cruise passengers and those embarking on cruises to the Norwegian Fjords, Baltic Sea, Canary Islands, Mediterranean and the classic transatlantic voyages to New York. The cruise terminals in Southampton are all fairly close to each other and some are within walking distance of the local hotels if you don't have luggage. The City Cruise terminal and Ocean Cruise terminal are very close to Red Funnel's ferry terminals on Town Quay. Oceans (+44 2380 331395), 160 High Street, Southampton offer a left-luggage service for cruise passengers. Visiting cruise passengers - If you have a day or half-day to spend in the city, why not visit the Isle of Wight? We offer special packages to cruise ship passengers to iconic places such as Osborne House (Queen Victoria's beloved palace by the sea), Carisbrooke Castle (a quinsequential English castle), Godshill (the model English village), The Needles (the famous chalk outcrops), Cowes (the spiritual home of international yacht racing). Packages include return ferry crossings and travel on connecting bus services. Details of 2017 packages will be published in March 2017. Apart from Red Funnel's ferry services between Southampton and the Isle of Wight, White Horse Ferries operate the Hythe Ferry between Southampton's Town Quay (Terminal 2) and Hythe on the Western Shore of Southampton water. Hythe Ferry takes just 12 minutes to travel between Hythe and Southampton where there are excellent connections to/from the Isle of Wight. At Hythe, there are good bus links to the Waterside villages of Dibden Purlieu, Marchwood, Fawley and the delights and attractions of the New Forest including Beaulieu, Exbury Gardens, Lymington, Brockenhurst and Lyndhurst. Red Funnel and Hythe Ferry offer through-fares from Hythe to East & West Cowes and vice versa for Islanders wishing to visit Hythe's famous Tuesday market and the beautiful New Forest. Bicycles are carried FREE from East Cowes to Southampton and can be taken on the Hythe Ferry for a small charge. 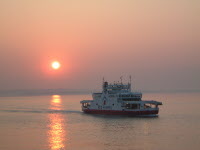 Apart from Red Funnel's ferry services between Southampton and the Isle of Wight, White Horse Ferries operate the Hythe Ferry between Southampton's Town Quay (Terminal 2) and Hythe on the Western Shore of Southampton water. Red Funnel and Hythe Ferry offer through-fares from Hythe to East & West Cowes and vice versa for Islanders wishing to visit Hythe's famous Tuesday market and the beautiful New Forest. Bicycles are carried FREE from East Cowes to Southampton and can be taken on the Hythe Ferry for a small charge.